Now typically I loathe mobile VR, including Oculus’ recent offering of the Oculus GO. My primary gripe is always the same: lack of positional tracking. For those who landed on this article from Google, and might not know what that means, here it goes: low-end headsets can only really track your heads rotation. That is, if you look left/right or up/down the VR headset (such as GearVR or Google Cardboard) will track the the rotations of your head and make sure the virtual reality experience matches where you’re looking. However, if you lean in or out, or sway side to side, or maybe duck down or stand up – the cheapo headsets are incapable of tracking your position. Now, the original DK1, of which I purchased and built jerrysplacevr.com for, only had 3DoF. This was around 6 years ago – it routinely made people nauseous. It certainly made me sick on my first few days using it. When Oculus announced the DK2 – which I subsequently bought – it’s revolution was both a better screen and also positional tracking! Using a custom infrared camera users would mount on their monitor, the computer vision could track both your heads rotation as well as position in space. Many users reported this eliminating the nausea. Turns out, when you want VR to be compelling, you need to track the users head in space, so it feels like real life. When you only track rotations, there’s a mismatch between what you’re seeing and what your brain expects to see. This makes people sick. So the DK2 more-or-less solved this problem, at least, a little bit. It wasn’t perfect, but today in 2018, it’s proven solved. Many of my friends who got sick for the DK1 or even the DK2, can spend hours in Vive with no illness. Even though the resolution on the Vive and Oculus CV1 are far from perfect, good head tracking is key to making people feel comfortable in VR. Well, until the Lenovo Mirage Solo, “mobile VR” was strictly limited to 3DoF! And I felt like this was a major mistake and detriment to the industry. For quite a while Samsung was giving out GearVR headsets with the purchase of their phone. The problem, of course, is that the GearVR requires the Samsung phone to be inserted into the device, and it has no solution for positional tracking. It can track the users head with the phones gyroscope, but not position. As such, the GearVR, the original Google Daydream, and all Google Cardboard devices were strictly 3DoF and routinely made users sick. I find this terribly offensive, because the low-end VR is cheap enough that many people can access it, and immediately have a terrible experience. VR fans call this “poisoning the well.” That is, if most casual users have a bad experience with a free GearVR, they might be permanently turned off from Virtual Reality. Realistically, they need to try the Rift, Vive, or now the new Lenovo Mirage Solo to have a truely compelling experience. So I mention all this, because like I noted above: the Lenovo Mirage Solo is the FIRST mobile headset that has full 6DoF! Yup! This amazing mobile headset can both track your heads rotation as well as it’s position – and it does it way better than I expected. In military aviation terms, “Dead Reckoning” is the ability for a pilot to know his position in space, purely on his mind / sensory input. In theory, I piolot could dogfight in fog and still know their orientation simply through dead reckoning. In VR terms, Dead Reckoning is sometimes called inside-out, but for me it’s basically the same thing. Using sensors and camera data, the Lenovo Mirage Solo can reckon it’s position in space without any necessary tracking device. The Rift requires cameras, and the Vive requires laser lighthouse boxes. But the Lenovo has complete freedom. Using image processing from it’s duel front facing cameras, it can work out its position in space more or less in real time – and it’s FAST. I tried a prototype of this headset and the positional tracking had noticeable lag, but now the consumer version is FANTASTIC. There are some limitations – it wont track well in low-light, or in rooms that have featureless white walls – for example. But when I put the headset on, usually after a second or two it will say “tracking resumed” as it remembered your room. The tracking has no noticeable latency, at least to me, and feels just like I’m using a Vive – but better. Better, because the screen is higher resolution, and there’s no cords attached! I still think the HTC Vive is the most compelling / best experience headset on the Market today. But the Lenovo Mirage Solo is by far the best mobile experience – by a LARGE margin. No other mobile solution has 6DoF, so it’s a clear winner – even if it’s 6DoF has some gotchas. Speaking of Gotchas – it only has one hand controller, and that controller is still 3DoF. Makes sense – it has no cameras, and the device doesn’t have external tracking sensors, so the controller is limited to is gyroscope, without battery draining, CPU eating cameras for Dead Reckoning. Still though, a 3DoF controller is compelling enough, considering the headset is comfortable and not puke-inducing, thanks to it’s 6DoF. Another gotcha is that the tracking isn’t room scale, and being Android based visuals clearly cannot be as fine as a PC based experience. But, as a entry level headset that’s mobile and wireless, the Lenovo is by far the clear winner. I can finally recommend a mobile headset and confidentially feel good about it. I don’t have much to say here, other that the screen is a noticeable improvement over the Oculus Rift CV1 and HTC Vive. I hate to admit it, but the Oculus Go does have a better display IMO, but it’s wasted on the Go’s lack of 6DoF. Ew. One of the best aspects of the Lenovo Mirage Solo is the fact that it runs Android. Specifically, an Android rom designed for Google Daydream. When you put the headset on, it has a full installation of Android adapted for VR – and it works well. The controller has a clickable touch-pad that works naturally with scrolling and clicking, and even with just the 3DoF you can effortlessly click and manipulate UI widgets. But with a matured Mobile OS like Android, it has features like security permissions, file browser, ability to use and browse Micro SD cards, app installation both from a custom DayDream playstore, as well as APK’s from a SD Card. With developer settings enabled the same as an Android phone, builds can be sent over wire or wifi and even stream the in-game view to a Google Chrome-Cast or the game editor via a plugin. Of course there’s a browser, as you’d expect with more-or-less a full Android install. The same cannot be said about the Oculus go – which has a custom UI instead of a full OS, and a walled garden store. If you want to play with VR, but don’t want to build/buy a gaming PC, and cannot afford the HTC Vive or the Oculus Rift, then this Lenovo Mirage Solo is THE ONLY OPTION. 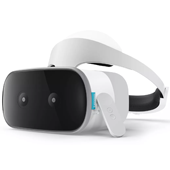 I really mean it – it’s the first all-in-one mobile VR device that not only has 6DoF (the most important part), but also has the backing of a mature OS, cleverly modified for VR. I still think the original Google Daydream offering was a disgrace, but this Lenovo running Daydream Android is wonderful. Again : Six Degrees of Freedom. 6DoF, 6DoF, 6DoF, 6DoF, 6DoF, 6DoF. Again, if you don’t want a PC based VR Solution, get this headset! As of mid-2018, it is by FAR the best headset.